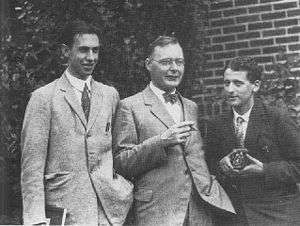 George Uhlenbeck, Hendrik Kramers, and Samuel Goudsmit circa 1928 in Ann Arbor. Subsequently entered Delft University of Technology as a student in chemical engineering. During the next year, he transferred to the Leiden University, to study physics and mathematics, and he earned his bachelor's degree in 1920. Uhlenbeck was then admitted by Ehrenfest (a student of Boltzmann's) to the Wednesday evening physics colloquium in Leiden. Ehrenfest became the most important scientific influence in his life. From 1922 to 1925 Uhlenbeck was the tutor of the younger son of the Dutch ambassador in Rome. While there, he attended lectures by Tullio Levi-Civita and Vito Volterra and met his longtime friend, Enrico Fermi. In 1923, Uhlenbeck received his master's degree from Leiden. He returned to Leiden in 1925 to become Ehrenfest's assistant. Ehrenfest assigned him to work with his graduate student, Samuel Goudsmit for a quick update on "what was currently happening in physics". In mid-September 1925, Uhlenbeck and Goudsmit discovered the spin on the electron. In 1927 Uhlenbeck earned his Ph.D. degree under Ehrenfest with his thesis titled: "Over Statistische Methoden in de Theorie der Quanta" ("On Statistical Methods in the Quantum Theory" ). Uhlenbeck married Else Ophorst in Arnhem, Netherlands in August 1927. He received a doctorate from the Leiden University in the same year. As a graduate student in 1925, he and Samuel Goudsmit introduced the concept of electron spin, which posits an intrinsic angular momentum for all electrons. During part of World War II, from 1943 through 1945, Uhlenbeck led a theory group at the Radiation Laboratory in Cambridge, Massachusetts which was doing radar research. In 1945, he returned to Ann Arbor, where he was named the Henry Cahart Professor of Physics in 1954. He remained in Ann Arbor until 1960, when he joined the Rockefeller Institute for Medical Research (now the Rockefeller University) in New York City as a professor and member of the Institute. Uhlenbeck died on October 31, 1988, in Boulder, Colorado at the age of 87 years. Uhlenbeck received five honorary degrees. In addition, he received the Research Corporation award in 1953, the Oersted Medal of the American Association of Physics Teachers in 1955, the Max Planck Medal of the German Physical Society in 1964, the Lorentz Medal of the Royal Netherlands Academy of Arts and Sciences in 1970, the National Medal of Science in 1977, along with Goudsmit, and the Wolf Prize, also shared with Goudsmit, in 1979. ↑ Dresden, Max (December 1989). "George E. Uhlenbeck". Physics Today. 42 (12): 91–94. Bibcode:1989PhT....42l..91D. doi:10.1063/1.2811256. ↑ "George Eugène Uhlenbeck (1900 - 1988)". Royal Netherlands Academy of Arts and Sciences. Retrieved 17 July 2015. ↑ Cohen, E. G. D. (1990). "George E. Uhlenbeck and statistical mechanics". Amer. J. Phys. 58 (7): 619–625. Bibcode:1990AmJPh..58..619C. doi:10.1119/1.16504.